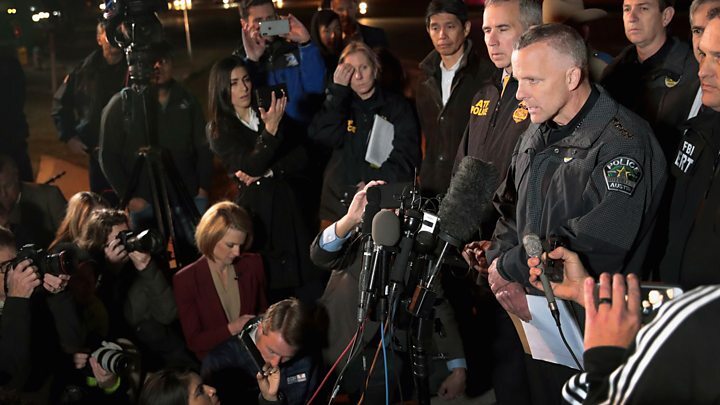 US media have identified the suspect linked to a series of deadly parcel bombs targeting the Texas city of Austin as Mark Anthony Conditt, 23. The man was killed after he detonated an explosive as officers approached his car following a chase in Round Rock, north of the Texas state capital. Officials say he lived about 20 miles (30km) from Austin in a shared home. 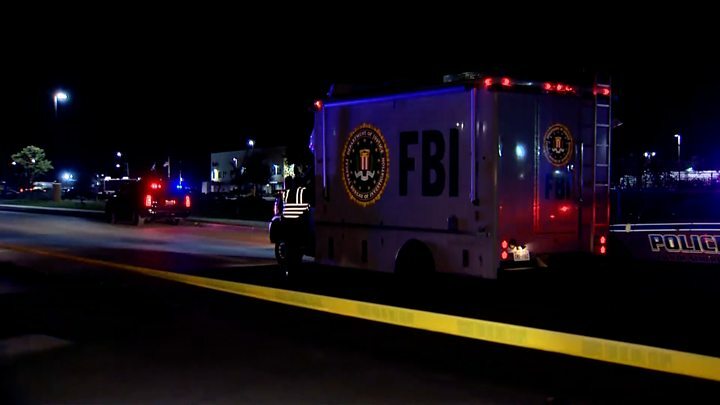 The incident follows four bomb attacks in the Austin area. Officials warn he may have placed more bombs in the area. Police have not formally identified the suspect, but he has been named in US media as Mark Anthony Conditt, aged 23. Texas Governor Greg Abbot told Fox News that he lived with two flatmates in Flugerville, about 20 miles south of Austin. He added the two flatmates have been talking to authorities, but were not suspected of any crimes. Mr Abbot said the suspect did not destroy his online footprint, which may provide investigators with a “treasure trove of information that should shed light on who he is, what he did, and why he was doing it”. According to the Austin American-Statesman newspaper Mr Conditt graduated from the Austin Community College after he was homeschooled by his mother during his high school years. The newspaper reports that he had worked for Crux Semiconductor in Austin as a “purchasing Agent/buyer/shipping and receiving”, citing a profile on a job recruiting website. The Austin police department on Tuesday used footage from a FedEx store in south Austin, the scene of the latest parcel bomb explosion, to identify the male suspect. After using the Google search engine to gather information on the suspect’s online browsing history, which showed searches on facilities which were used to ship packages, authorities later managed to locate his vehicle. In the early hours of Wednesday, local and federal officers took up positions around a parking area near a hotel in Round Rock, about 20 miles (32km) north of Austin. As they waited for tactical teams to arrive, the vehicle started to drive away and officers pursued it. When the vehicle eventually pulled over, armed officers approached, but the suspect then detonated a bomb, injuring one officer. Another officer opened fire. APD is working an Officer Involved Shooting in the 1700 block of N. IH-35. Media staging area will be at the Sherwin Williams Paint, 3321 N. IH-35. APD PIO will be en-route. Police later confirmed that the blast had killed the suspect. Austin police chief Brian Manley said that local residents should “remain vigilant”, and urged anyone who noticed a suspicious package to contact the authorities. “We don’t know where the suspect has been over this past 24 hours,” he said, adding that it was possible that additional devices may have been distributed. Mr Manley also praised his colleagues in a tweet. “I can’t thank the men and women of #AustinPD or our Federal partners enough for their tireless work in restoring peace to our community,” he said. Earlier, CCTV images of a “person of interest” were shared on US media showing a white male with blond hair carrying a number of large packages at a FedEx store in Austin. Austin has been on edge amid the attacks, which have led to the deployment of hundreds of police officers in the city. Two people have been killed and six injured in the bombings. This was a dramatic denouement to a three-week reign of terror. It was only in the past 36 hours or so that police really got a handle on the possible identity of the suspect, who had foxed them for weeks by changing the nature of his targets and his method of operation. But the sheer number of devices – six in all – in such a short period of time may have been one factor that eventually led to his pursuit and apparent suicide. 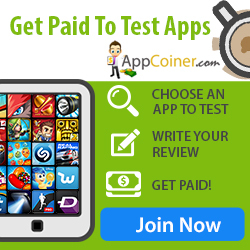 Another crucial factor was the one device that didn’t go off. That gave police key leads and allowed them to isolate CCTV evidence of the suspect dropping off one of the devices at a FedEx office. As police continue to gather evidence at the scene, motivation will be the question on everyone’s lips in Texas. And while this might feel like it’s over, the admission from police that they don’t know where the suspect was for the past day means more devices could be out there and it is too soon for Austin to completely relax. What do we know about the bombings?